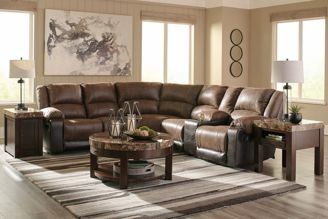 There’s no “I” in team, and you’ll want everyone you know to feel the comfort of the Nantahala 6-piece sectional. 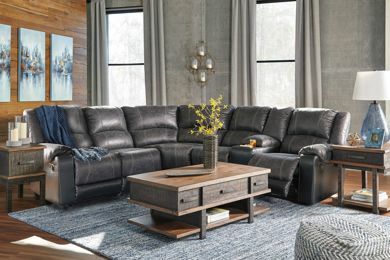 Slate gray and black faux leather upholstery add a nice contrasting element to the plump cushions. Take it a step further with jumbo stitching that makes the distressed finish pop. Accommodating storage consoles and cup holders are a great addition. Seat Depth: 39"